Hopper Time on the Mo! Denny with this nice Brown Trout caught blond fishing Wednesday morning. Then we tossed tiny dries at Trico fish for 3 hours. Then hopper fished all the way home. A nice time to be on the Missouri River with the dry fly fishing considered by many, out, and certainly the industry characters…Very Good! Is it July or early August action on the techy dry fly? No. Not really. But good action for the morning session if you like hunting heads. And we certainly do. The Blackfoot is fishing well too. I am headed that way this morning with a couple long time guests from Arkansas. They like a day over the divide on their annual trip to the Missouri River. Nymphing is great too. Head up to the Holter Dam and row around in circles. Fish are up there en masse! Zebras, Czech’s, Little Green Machines, Two Bits, S & M’s, Frenchie’s and more are ont he list of must have nymphs this time of year. The river is still relatively quiet. 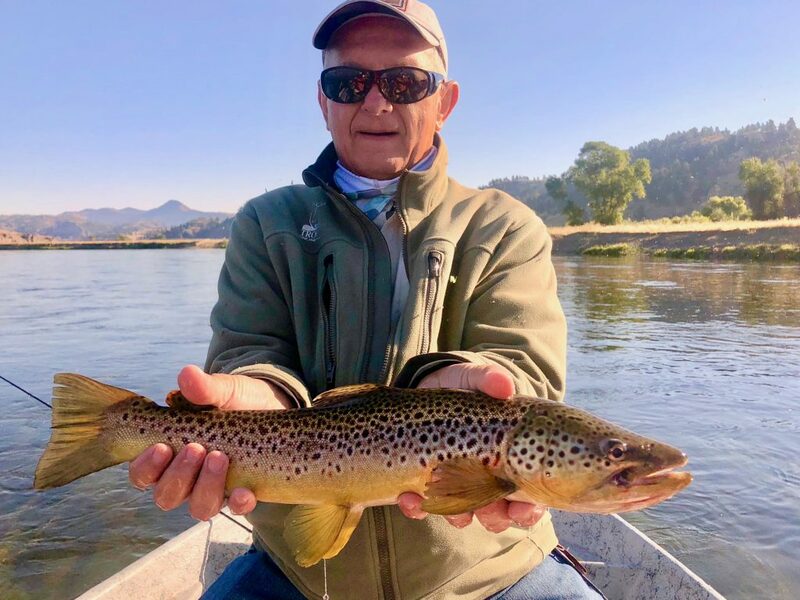 While we do see an increase in guided guests in September we commonly will not see another boat ont he river, if you fish anywhere but the dam, for long periods of time. Book your Autumn trip today! Also openings in Headhunters Advanced Fly Fishing School this October. A great way to enjoy the Mo with like minded folks learning advanced skill sets to help you catch more fish!!! All inclusive, meals, flies, info, education, lodging. Call today for more on this very popular fly fishing school! Autumn shop hours 7-7 daily. Guide availability is good, local lodging, the best in flies with stuffed bins (we don’t run out of the good flies! ), summer sale items galore, demo rods, discontinued stock, and so much more here in downtown Craig. I remember trying for a blonde and landing a brown. You know how much I like fishing with that blonde.